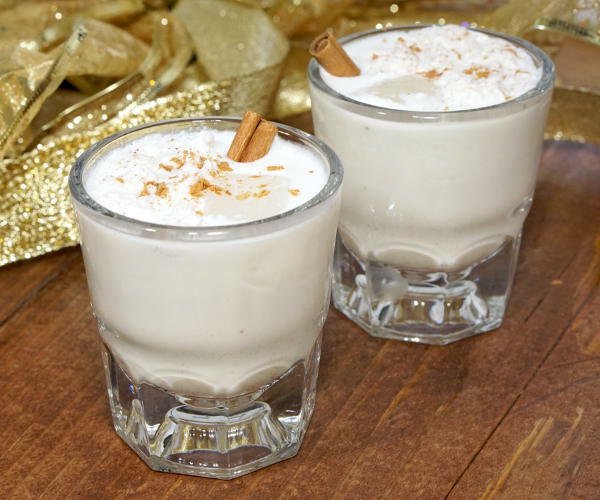 Rum and coconut milk give the Puerto Rican twist on eggnog a Caribbean flair. 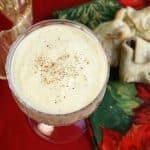 Smooth and creamy, this Coquito recipe is an easy drink to whip up for your holiday party guests! 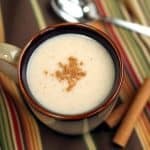 While Eggnog may have originated in England, it has been adapted many ways, particularly in the States and Latin America. Doing a little research on Latin American versions of Eggnog, you’ll find that Mexicans have Rompope, Cubans have Crema de Vie, and Puerto Ricans have Coquito. It’s the last one that we’re talking about today. 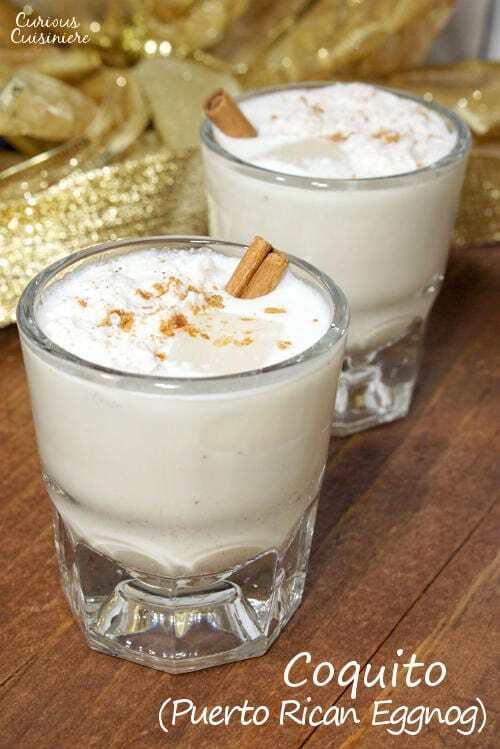 There is actually very little history or legend available as to the origins of the Puerto Rican version of Eggnog, Coquito (pronounced koh-KEE-toh). 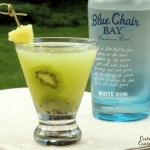 Spanish and English settlers would have most likely brought their version of the drink to the Caribbean, and then started adapting it for what ingredients were readily available. Literally translated, ‘little coconut,‘ it’s no surprise that once in the Caribbean, coconut found its way into the mix. What also became traditionally included was canned evaporated and condensed milk. Now, if you’re a regular reader here at Curious Cuisiniere, you’ll know that we typically try to avoid such tinned concoctions, in favor of making everything from scratch. However, EVERY bit of research we did on Coquito pointed to the fact that the traditional way to make this drink was to pop open three cans: coconut milk, evaporated milk, and sweetened condensed milk. So, in favor of authenticity, and simplicity, we decided to lay our “everything from scratch” tendencies aside and give this drink a try the traditional way. It is the Holidays after all! When we say simple, we really mean it. What can be more simple than pouring a few ingredients into the blender, giving it a good whir, until it picks up a little froth, and then pouring into glasses to enjoy? It’s the perfect, easy party drink for this busy time of year. There is debate as to whether or not traditional Coquito should contain eggs. Some say absolutely, others say absolutely not. We’ll leave the final decision up to you, but for this version, we opted to go egg-less to make it easier to serve the drink at a party, where it may set out all evening, or bring it to a gathering to share with friends, where you might not want to lug the cooler around with you, particularly after you are all decked out in your holiday finest. 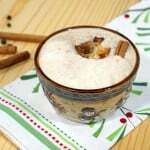 Our Coquito recipe creates a lightly sweet beverage with a wonderful mingling of spices and nutty coconut. If you like your drinks sweeter, feel free to add more sweetened condensed milk. Have fun with the flavors until they’re the way you like them! Coquito is traditionally STRONG, and yes, ours follows that traditional tendency. Traditionally Coquito is served out of shot glasses (small aperitif glasses would work too). If you would prefer to serve it in a larger cocktail glass or rocks glass (like we did here) add an ice cube or two into the glass. This will keep the drink delightfully chilled and help cut the richness, just a bit. Coquito, the perfect holiday drink for a crowd! Place all ingredients into the bowl of your blender. Blend until well mixed and slightly frothy, 2-3 min. Pour into a bottle and refrigerate until cold. 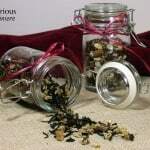 Just before serving, blend again or simply shake well to mix and froth. 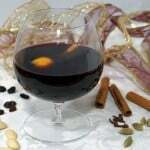 Serve in chilled shot (or aperitif) glasses and sprinkle with cinnamon to serve. 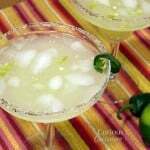 If using larger cocktail glasses or rocks glasses, serve over ice. Coquito will keep in a sealed jar in the refrigerator for 1 week. Shake before serving. Made this for New Years, taste is great and I know it will be better tomorrow!! 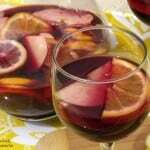 Thanks for sharing a “simple” receipe for my favorite beverage at the holidays!!! So glad you enjoyed it! Happy New Year! I’ve done something wrong here because mine taste like spiked baby formula. I remember having Puerto Rican eggnog years ago and thinking it was deliciious. In reading the coconut milk label it’s a blend of coconut milk and coconut water blend by Califia farms. 48 Oz bottle. I used Don Q cristal Puerto Rican rum. I followed everything exact. 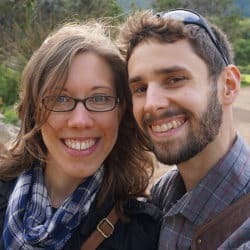 Should I have purchased 100 % coconut milk instead of milk/water blend? Is this the right rum. Help!! How interesting Sean. We’re sorry you’re having trouble. I would venture that it is the coconut milk being a milk/water blend that just isn’t giving the right texture or flavor. Hope you can give it another try with 100% coconut milk! I add Goya frozen coconut bits to it..Yummy. That’s how my neighbors,who are Puerto Rican make it. That does sound like a delicious addition! I prefer a high quality Coconut Milk from the refrigerated section over the canned. Thank you for The recipe . I’ve always wanted to make this drink. 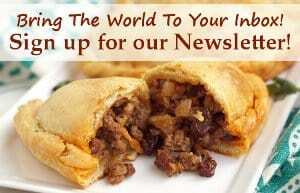 As I am Puerto Rican but I’m not a big chef or kitchen lover. This recipe is so simple I don’t have to b a chef! Thanks Marisol! We hope you enjoy it! Thank you. For being here. For folks like me. You’re welcome! We hope you enjoy the coquito! Coconut rum would add a nice, extra coconut punch. Go ahead and give it a try! Love New recipes,looking forward to yours. This was soooooo awesome the first time I made it. Maybe a bit on the sweet side. Today, the second time, I forgot the sweetened condensed milk. DO NOT FORGET the sweetened condensed milk! Just add more rum if its too sweet. Good tip Teena! More rum is always a good option!